Some of my best memories growing up were the days we decided to pop into the car and drive out to a farmer’s market for some corn or fresh melons. Inevitably, there would also be some homemade fudge to buy as well. What could be better. It was an adventure and a roadtrip for food. Everything was fresh and homemade. This may have been the genesis of my food-focused wanderlust. 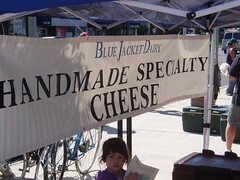 Today I don’t have to work so hard for the adventure, I can ride my bike to the Saturday Clintonville Farmers Market. The market has slowly grown over the years, it is not big by any measure, but it has sustained itself and it promotes things that are easy to feel good about – local farms and businesses selling their goods to the community. As you can see above there is a really good turn out. There are free samples from many vendors and stacks of good information. A couple shots of vendors you may see at the market are below. The larger and better known community/farmers market is in Olde Worthington. 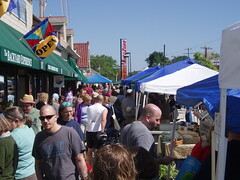 This market also features crafts and other items. Last, year a successful try was made at a year round market, with some vendors coming in for select Saturdays in the wintertime to keep the fires for local food and produce burning. And of course there is the North Market Farmers Market – the market have been at it for more than 100 years so the concept works. I mention the North Market often in my blog, and with good reason – the place is wonderful. It is great to have these markets doing well locally. There are also two great resources for getting up to date information on Farmers Markets and CSA’s (Community Supported Agriculture). Two of my fellow food bloggers offer market updates and wonderful photos from local markets. If you are on the road and looking to find some markets to mix up the drive or put a speedbump to potential roadrage, here is a handy site to do some market research. A recent discovery of mine, is not so far away. 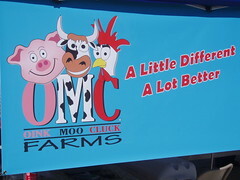 This little market has a great selection of meats and cheeses, with prices that beat the big box stores. 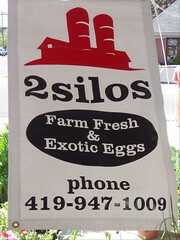 They also have the typical selection of farm fresh tomatoes, corn, etc. With a little planning, you can support local, sustainable farming without emptying your wallet on gas prices or food costs. Maybe you or someone with you will be inspired to planet a garden, eat something new or appreciate the opportunity to meet the person that supplies your meat, eggs, milk, or salad on some Saturday. This entry was posted on July 31, 2008 at 3:56 PM	and is filed under culinary knowledge, markets, Ohio. You can follow any responses to this entry through the RSS 2.0 feed. You can leave a response, or trackback from your own site.